My wife and I have both scheduled vacation days off work and are letting our kids take sick days from school on Friday, December 15th so we can all go to see Star Wars: The Last Jedi together the first morning it is in theaters. Yes my family is made up of Star Wars fanatics! To share my family's enthusiasm about The Last Jedi, A GEEK DADDY has partnered with The Hopping Bloggers to host a fantastic Star Wars giveaway worth over $300! Not all prizes are pictured. Products subject to change based upon availability. 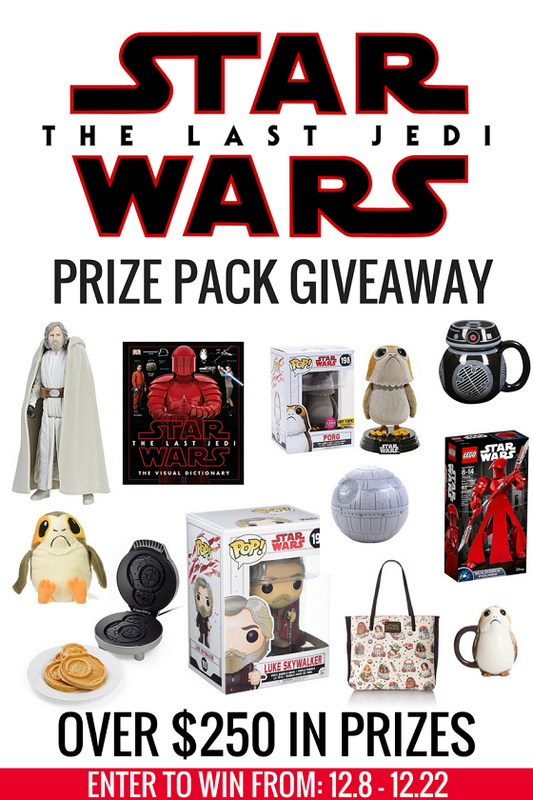 Enter to win this Star Wars: The Last Jedi Prize Pack using the form below. The Last Jedi Visual Dictionary and the blu rays are something I could look at over and over. Everything looks great! I'd like to give the tote bag to a family member! That Electronic Porg Plush! and that Porg mug! Oh my gosh! That Electronic Porg Plush! That Porg mug! Because Porgs are so adorable! So excited to see the BB-8 waffle maker! Love him and love waffles!